A St. Petersburg navy design bureau says it is ready to build a Russian-made alternative to the troubled Mistral carriers, which remain moored in France. The intended new ship dubbed Lavina (‘Avalanche’) promises to be bigger and faster than the Mistrals. The technical specifications of the helicopter carrier were revealed in a presentation given by the Krylov State Research Centre, at the Army-2015 military expo near Moscow. Lavina will have a full load displacement of 24,000 tons, as opposed to 21,300 tons for the French-designed ship. It will also have a maximum speed of 22 knots, compared to 19 knots for the Mistrals, two of which were ordered by the Russian Navy four years ago. 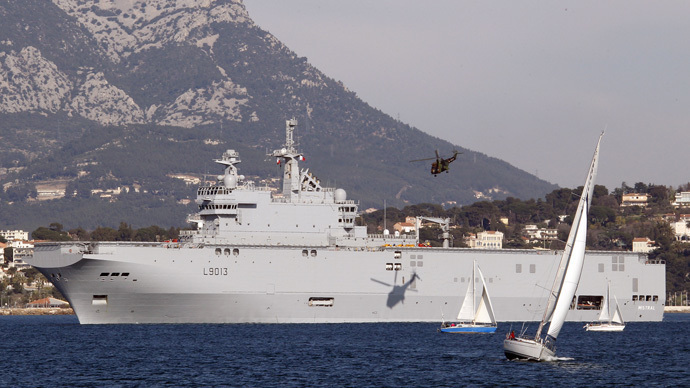 Just like the Mistral, Lavina will house 16 helicopters, about 50 armored vehicles (about 10 fewer than the French amphibious assault vessel) and a potential six smaller boats, as opposed to the Mistrals' four. All figures are likely rough estimates, with numerous variables, and it is unclear how advanced the Lavina blueprints are at the current stage. The two Mistral-class ships, custom-built for Russia for a price of €1.2 billion, have been completed, but their delivery has been suspended by France, following Crimea’s accession into Russia last March, and the outbreak of violence in eastern Ukraine. Domestic shipbuilders are competing to fill the gap. Earlier this week, Priboy, a 14,000-ton helicopter carrier, also capable of transporting 16 attack helicopters, was announced by Nevsky Design Bureau, another leading St. Petersburg design bureau. It said that plans were afoot to begin construction next year. Last week, the Yantar shipyard also reportedly began construction of a smaller Ivan Gren-class assault vessel, which the Navy said would be ready by 2018. It seems unlikely that all of these projects will be greenlighted simultaneously, but officials have confirmed that an amphibious vessel capable of performing a landing thousands of miles away from its home port is a centerpiece of its naval strategy up to the year 2050. Meanwhile, according to a senior official who spoke to TASS news agency on Wednesday, Moscow has not ruled receiving its original order from the St. Nazaire shipyard, and negotiations are “ongoing.” If the delivery is not made, as appears increasingly likely, the biggest stumbling block remains the size of the compensation for the canceled order. The latest public pronouncements show that France is offering under €800 million in compensation, while Moscow is holding out for at least €1.1 billion.